We’ve made the decision to stay on board this winter. This is our first winter on a boat in the northern hemisphere. We feel that every moment that passes is nostalgic, important and gone, so whatever we’re doing, we must enjoy it, and keeping warm is part of the enjoyment! Seven-thirty in the morning – the frost stayed with us all day. Don’t turn the heating off, just turn it down. 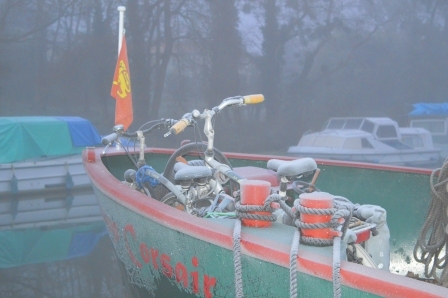 On those really chilly days, it takes too long to warm the whole boat up again if you turn the heating off. Just turn it down and let it simmer, keeping the boat warm all day. Have project to keep you entertained. We are renovating the interior. It is bedlam on board, we are focussed on the job at hand and not indulging in the cold. We finished the exterior painting just before winter set in – perfect timing. 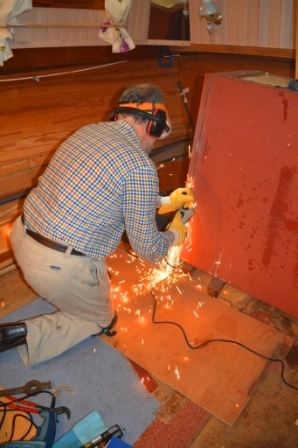 Noel cutting ‘bits’ off -making a waste tank from old water tank. Buy good gear to wear for those times you have to step outside! This doesn’t mean spend lots of money. The charity shop near us has an abundance of great clothes – layering is the key. Hats, scarves and good gloves and socks are a must – heat escapes at your extremities. Watch the weather – be prepared. If you are totally independent, like us (ie without the constraints of a car), the weather will be important for days you want to go shopping. We cycle seven kilometres to the nearest large town. It’s an easy ride, but we time it with bright, dry days. 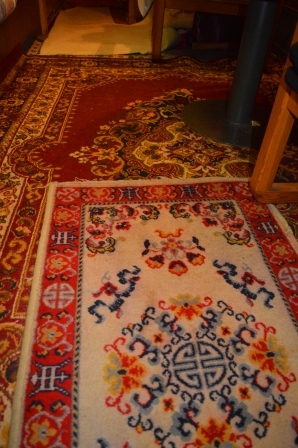 In the autumn we bought half-a-dozen thick floor rugs, which insulate the floor brilliantly. 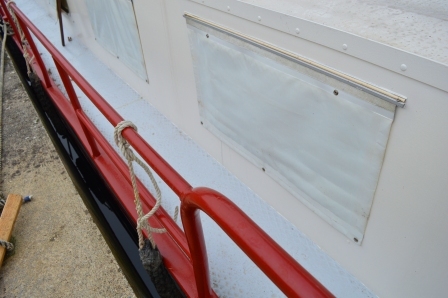 We have plastic ‘blinds’ outside our portholes which we clip down each night. 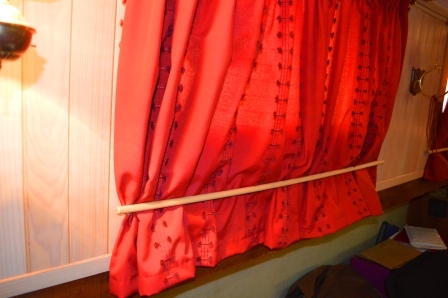 The curtains are tucked in (yet to be painted) to prevent the warm air being sucked up to the windows and cooling. Under our mattress, we’ve placed a layer of carpet – it all helps. Food keeps you warm and energised. We tend to eat small meals often. Tea and toast in the morning, porridge mid-morning, a light-lunch, a snack mid-afternoon (fruit perhaps) and then dinner. It helps keep our tummies warm and therefore keep us warmer. What tips and ideas do you have to surviving winter in Europe? 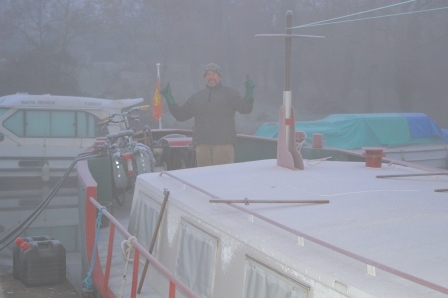 Categories: Life on board | Tags: enjoy life, every moment, exploring europe by boat, france in winter, living on a boat, nostalgic, on a barge in winter, on a boat in winter, stay on board in winter, surviving winter | Permalink. Good ideas there for wintering on a barge in Europe, Jackie and Noel. I takes us a good 24 hours to get our 19.9 Mt Tjalk warm again after the heating is off. We have an AGA and Barrie designed and built a jacket of copper coils for in it which runs water through it, heating it for the under floor heating. It doesn’t get hot like underfloor heating can do in a house but it takes the chill off and we have even temperatures, aided by 2 small silent computer fans near the centre beam on the ceiling that moves the warm air around. There is nothing as welcoming as coming through the companionway to a toasty warm interior – then a cup of steaming tea. AAhhhh. Bliss……. That certainly sounds like bliss Carole – your Barrie is a clever chap! What a lovely picture you painted there – would love to pop around for a cuppa! Under-floor heating is a fabulous idea, our floors get really cold, so grateful for the rugs. I’ve seen the computer fan idea before- friends had a diesel fire and they place a small fan to blow across the chimney that got quite hot! Great ideas all-round.. Now I’m going to put the kettle on – fancy a cuppa? Great tips! Could well be applied to spending summer in Alaska, haha! Thanks! You guys are the experts!